Seriously, u can think of thousands of dishes for appetizer but I's looking for something easy, not time- consuming , with the available items from my pantry. Then I remembered eating this pinwheel back when I's pregnant. (From showmethecurry) Actually u can make stuffing per choice ,but boiling potatoes ,cutting the veggie's, again gonna consume more time, instead i used paneer and that hardly had taken one minute to finish with my stuffing and the pinwheels were done in 20 minutes..Hooray..Mission accomplished !!! Thaw the pastry sheet for 20 minutes. Preheat the oven @ 400 deg F. Meanwhile , make the stuffing for the pinwheels. Crumble the paneer finely and add all the ingredients except oil . Combine well. Be extra careful while adding salt as the chaat masala powder already has some salt.Heat the 1/2 tsp oil and add the paneer stuffing masala and saute for 30 secs to 1 minute. ( not more than that) . This step is to make sure the masala incorporates well with the paneer. Transfer the stuffing to a bowl . Dust the working space with flour and spread the pastry sheet. Apply little bit of flour on the top as well. Roll out the sheet little bit using a rolling pin. Spread the stuffing equally on the sheet leaving an inch space on the other side ( for sealing ).Now roll the sheet tightly while being gentle and apply little bit of water on the space (edges) we already left for sealing. Now seal the edges by rolling and make sure it's completely sealed. Using a sharp knife, gently cut an half inch wheels and place on the greased tray. Bake it for 15 minutes or until light golden brown . Remove from the oven and cool for a minute. Then serve warm ... Great for parties / potlucks.. Check out the 25 bloggers running the next 4 days for the Blogging Marathon !!! Absolutely great shanavi... love your clicks too.. I have guests for dinner tomoro night.. Wanna try this! 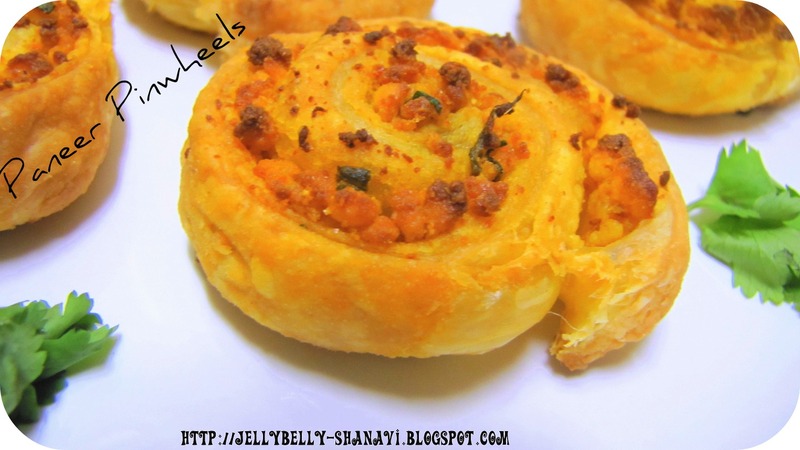 Paneer pinwheels looks awesome great appetizer. OMG really very tempting n delicious wheels dear..
You pin rolls r amazing. Those pinwheels looks soo delicious,inviting and easy breezy appetiziers..
will make for a perfect appetizer for any party..yummy looking! Wow fantastic and mouthwaterin recipe. Cool pin wheels. Will make great hors d'oeuvres for parties. Very delicious..wish we get those pastry sheets here..
Another beautiful click! I have not tried the pinwheels with paneer. 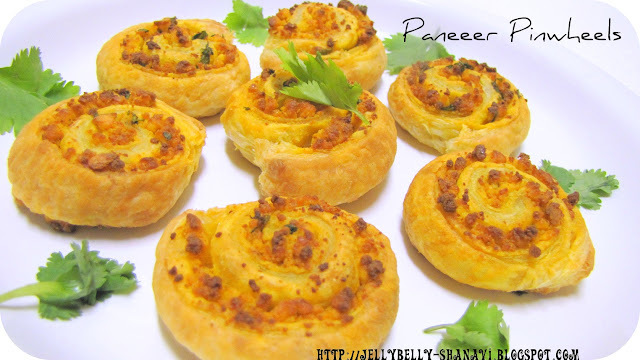 A friend of mine always tells me how good the paneer pinwheels taste. Withh try it some time. I think I saw that one in "Show me the Curry"